Intel considers virtual reality a key growth vector as it reshapes to survive in a post-PC world, and new Core i7 Extreme Edition chips will play a big role in that transition. The new chips, code-named Broadwell-E, are speed demons with up to 10 cores, a new high for Intel PC chips. Primarily for gaming PCs, the new chips will also go in desktops certified to work with headsets like Oculus Rift and HTC Vive. The Core i7-6900 series and 6800 series chips are targeted at enthusiasts looking for the latest and greatest technologies in PCs. These chips can be overclocked and unlocked, which could instantly upgrade PC performance by cranking up CPU frequency. Virtual reality PCs typically need top-end gaming PC performance with the fastest CPUs and graphics cards. If the performance lags, the experience on VR headsets can be nauseous. There's been interest in VR for gaming, education, medical and engineering applications. PCs with these chips will aid in the creation of VR content, which could, for example, teach students in a medical school virtually about surgical techniques. The chips are faster than its predecessors like the Core i7-5960x in content creation, Intel said. The Broadwell E chips are up to 35 percent faster in 3D graphics rendering, up to 25 percent faster in 4K video editing using Adobe Premier Pro CC, and 25 percent faster in 360-degree video creation using Kolor Autopano Video Pro, according to Intel. A key performance booster is Intel's new Turbo Boost Max 3.0 technology, which provides more horsepower when needed when executing a task. Turbo Boost Max is 15 percent faster than older Turbo Boost technologies, which also helps make chips use power more judiciously. Turbo Boost Max 3.0 could roll into the mainstream Intel PC chips over time. In most cases, the Extreme Edition CPUs will be paired with powerful GPUs from Nvidia and AMD, which also have aggressive VR strategies. The combined cost of making a PC with such powerful components could easily run into the thousands. PCs with the new chips will get DDR4 memory and Thunderbolt 3 ports, which provide expanded connectivity to external graphics cards, storage, displays and other peripherals. The Extreme Edition chips support PCI-Express 3.0 for internal graphics cards or storage. 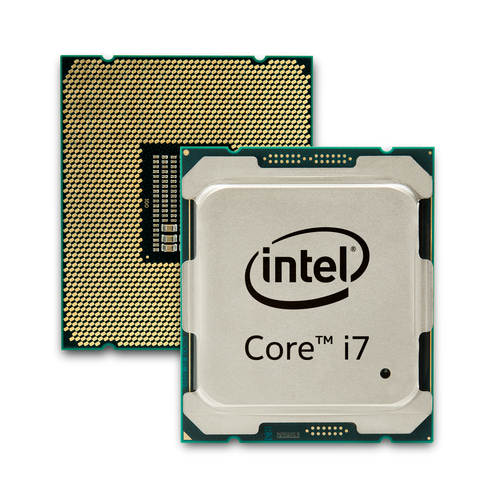 The fastest chip in the new family is the 10-core Core i7-6950X, which is priced at US$1,723. It has a clock speed of 3.0GHz, which can be cranked up to 3.5GHz. It has 25MB of cache, which is also a new high for Extreme Edition chips. For $1,089, enthusiasts can get the eight-core Core i7-6900K, which has clock speed of 3.2GHz that can be boosted to 3.7GHz. It has 20MB of cache. The other chips include the six-core Core i7-6850K chip, which is priced at $617 and the $434 Core i7-6800K. The 6850K has clock speeds ranging from 3.6GHz to 3.8GHz, and the 6800K from 3.4GHz to 3.6GHz. The chips have 15MB of cache. The Broadwell-E chips draw 140 watts of power.